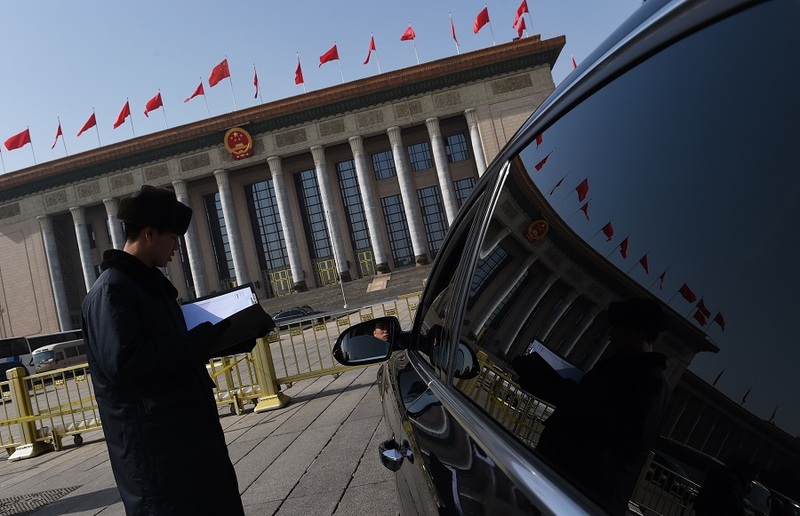 A security guard checks a car entering the courtyard of the Great Hall of the People in Beijing during a meeting on March 2, 2015. The Great Hall of the People is the venue for meetings of China’s Communist Party-controlled legislature, the National People’s Congress, with ‘rule of law’ high on the agenda last year. In early August, Beijing held show trials of four legal activists—a disheartening turn for those optimistic about legal reform in China. What are the prospects for the development of the rule of law in China under Communist Party Secretary Xi Jinping? How do law and politics intersect in Chinese life? Has China’s legal system become more resilient, predictable, and/or independent since Xi assumed leadership in late 2012? And how does one gauge progress in this area? On April 28 in New York City, ChinaFile and the Asia Law and Justice Program at the Leitner Center at Fordham University Law School co-hosted a conversation on these questions. Asia Society’s Matt Schiavenza moderated, and the University of Pennsylvania’s Neysun Mahboubi and Fordham’s Carl Minzner provided commentary. Matt Schiavenza: There’s a lot of evidence that Xi Jinping has consolidated political power to an extent not seen in China for decades. In fact, some say that he is the most powerful Chinese leader since Chairman Mao. This has implications for many areas, not least of which is law. Over the last couple of decades, the Communist Party has described implementing a legal system as a goal. Now the question is: Is Xi's ascension to power undermining attempts for the rule of law, how is it changing the Communist Party’s approach to jurisprudence, and what’s going to happen next? Neysun Mahboubi: Well, it's a great pleasure to be here and to see my good friends and colleagues, Carl Minzner and Marty Flaherty, and to do a second round of a public dialogue that Carl and I started at Penn maybe about a month ago, which was itself rooted in private conversations that we’ve had over some time. Now, China is a very complex place, there are lots of different things going on, and in many ways where you sit is where you stand, so we tend to see things more from the perspective of whatever particular aspects we’ve been focusing on—which of course isn’t to say there aren’t other things going on as well. I think on the whole, Carl and I probably agree more than we disagree, but we focus on slightly different things, so we’ve found a rich conversation in the shades of difference between what we’ve each looked at most closely. Overall, one might say that my take has tended to be more optimistic, while Carl’s has tended to be more pessimistic, and we’ve had a productive dialogue out of that difference. Of course, there are a lot of negative things going on in China right now, I certainly can’t and won’t deny that. I generally agree with pretty much everything that I expect Carl will be saying here. This is a very troubling period in many respects. Indeed, the Foreign NGO law was just passed today. That’s certainly something we should talk about, that’s going to be concerning—and not just for its implications for foreign NGOs per se, but perhaps even more so for its wider implications for Chinese domestic NGOs. And even with respect to those things I’m going to talk about in a moment, that have seemed more positive to me, there have been some recent negative developments. For example, Xi Jinping lately has been emphasizing ideological training among judges in the court system, in a way that seems contrary to some of the more positive aspects of the legal reform story I will be highlighting. Given the more negative things that have been happening with increasing force more recently, I’ve started to feel like the more positive aspects that I tend to emphasize are ever more aspirational than strictly descriptive. But I’m still trying to hold on to some slender reeds, notwithstanding the strong countervailing winds. I still think that they’re worth highlighting, that there’s some significance to them. So, when Xi Jinping and Li Keqiang first came to power, a lot of us noticed that their language about law and legal institutions sounded different from what we’d been hearing lately up to that point. And then their legal personnel appointments also seemed different from those under Hu Jintao and Wen Jiabao. The easiest example is that of the President of the Supreme People’s Court (SPC). During the later Hu Jintao/Wen Jiabao era, the president of the SPC was Wang Shenjun, a former police official who didn’t really seem to care that much about legal values or legal institutions. By contrast, the president of the SPC under Xi Jinping and Li Keqiang, Zhou Qiang, while certainly a politician who had worked his way up through the political ranks, nonetheless is a law school graduate who trained with that famous first graduating class from the Southwest Institute of Politics and Law after the Cultural Revolution, is deeply embedded in the legal community, and has close ties to many of the reformist figures of that community. That is just one appointment, of course, but there were many appointments like that throughout the legal system, right after Xi Jinping and Li Keqiang took over in 2012, that seemed to be promising, in terms of professional legal values. And then there was the Third Plenum of the 18th Central Committee in November 2013, which focused on economic issues, but included in its Communiqué and Decision some language about law and the judiciary in particular that also seemed promising. And then the Fourth Plenum, in October 2014, was the first plenum in the history of the Chinese Communist Party to focus on the topic of the “rule of law.” The lengthy Decision that was issued subsequently went into quite great detail about judicial reform and also administrative law reform. To be sure, the language of the Fourth Plenum Decision is so technical and even obscure that, if you don’t know what the drafters were referring to, you might think it was just verbiage. But, in fact, much of this language, and especially in the chapters on judicial reform and administrative law reform, ties very closely to specific items that legal reformers had been pushing for on the ground for many years up to that point. On first reading, this appeared to suggest there was a new degree of high-level policy support for such legal reform efforts. At the same time, the Fourth Plenum Decision also features a lot of language about the leadership of the Party over the legal system, and that, obviously, was troubling to many observers when the document was released. It seemed clear that recurring references to the leadership of the Party was in tension with the more appealing language elsewhere in the document about the importance of judicial independence and governance under law. Still, for those of us who were slightly more optimistic, or trying to be optimistic, our perspective was that the leadership of the Party was a given in the current environment. Maybe the drafters didn’t need to repeat it so many times, but anyway that was never going to be called into question by this document. All the very specific references to concrete, technical legal reforms, however, seemed genuinely promising and worthy of attention. Let me give you just a few examples of what I’m talking about. In the section on judicial reform, there is reference to making hearings the centerpiece of adjudication, and to providing more structural independence for front-line judges, perhaps lessening direction by higher-level officials or by so-called “adjudication committees” within the court system. There is also language about reducing interference by outside parties and political actors, even establishing a mechanism for reporting such instances. And there is language about developing new types of institutions such as “circuit courts” to handle challenging cross-regional cases. Similarly, in the section on administrative law—the law that has to do with how government has to make decisions—there is language about rooting administrative power in law, about enhancing public participation and openness in government decision-making, and about reducing administration discretion, that all connects directly and specifically to efforts by Chinese administrative law reformers in recent years. Subsequent to the Fourth Plenum, there was some movement in the legal system generally that seemed consistent with the kind of language I’ve been highlighting. For example, there were a lot of references in the Fourth Plenum Decision to lawsuits against the government and how litigants have faced difficulty in getting their cases accepted, or heard, or ruled on—or getting judgments in their favor actually enforced. The Decision was very clear about these dilemmas. So it seemed promising when, a couple of months after the Fourth Plenum, the legislative framework for suing the government in China, the Administrative Litigation Law, was revised, and in ways that appeared on its face to strengthen it, to make the possibility of more fair and effective adjudication of lawsuits against the government somewhat more likely. Around the same time, there were directives that the court system accept more administrative cases, to move to a scenario where courts wouldn’t be exercising quite so much discretion as to which cases they could accept, they’d more or less have to accept all cases filed and try to rule on them. And, since then, the number of cases—generally, but especially in administrative law, which tended to be a sphere where courts wouldn’t accept difficult cases—has gone up. Altogether, the number of administrative litigation cases almost doubled last year, from about 150,000 to about 250,000. That seems to indicate that there really was high-level political support for moving more cases from government or politicized dispute resolution to legal dispute resolution by the courts. All of this has seemed positive. What I’m going to emphasize most in concluding these opening remarks is that there remain a lot of things where we’re going to have to just wait and see how they turn out. For example, whether the increase in administrative law cases continues to go up, whether courts are really able to rule more fairly, and without interference, whether the circuit courts really become functional, etc. This is all somewhat up in the air right now, and a lot of the negative story that runs beside all this, which Carl will elaborate on, does cut against the possibility of these things working out down the line. I think that’s fairly clear. But one aspect of overall picture that I think is easy to pinpoint as a real positive is that a lot of these technical reforms that seem promising on their face are being pushed forward by legal professionals within this system, who were brought into being by the development of the Chinese legal system over the 30 years since the Cultural Revolution; who have been trained not just in Chinese law schools but also abroad in the U.S. and other foreign law schools; and who have a deep sense of legal values and the autonomy of law that is different from whatever may be driving the top leadership’s approach to law and legal institutions. So, even if you could say that a lot of the language about law and legal institutions that comes from Xi Jinping and the top leadership may be more in the nature of trying to strengthen institutions in order to secure Communist Party rule, or to make authoritarian governance more effective or more efficient, even if that’s the case, the people who are populating the legal system—the judges, the professors, the officials within the National People’s Congress—those people have a different set of values and ideas about the significance of law and legal values. It has seemed to me that the space afforded by the positive language of the Fourth Plenum Decision, and the rhetoric about law and legal institutions associated with that, has given that group of people some additional scope to push things forward. Indeed, those are the kinds of people who participated in the drafting of the Decision, who put in all that technical language that I’ve been highlighting. And so that to me is ultimately the cause for hope, that people like that exist and have space to function within the system. As we all know, China is fragmented and there are a lot of different things going on, and these people don’t necessarily share the same values, or hold the same approach to law and legal institutions that the top leadership does, and they do have some space to push things forward. Now, whether or not that’s enough to overcome the more negative aspects of the story, I don’t know. But at least there’s some grounds for hope. Carl Minzner: Thanks both to the Asia Society and the Leitner Center for organizing today’s event, and thanks to all of you for attending. As Neysun mentioned, we’ve enjoyed going back and forth with him privately over these issues for a while, so it’s sort of fun to now do it publicly. My basic take is that in terms of law and politics, I think China is clearly moving into a darker era. Naturally when I say that, the first thing people think about is the increasing state repression that is being directed at a range of actors: civil society activists, public interest lawyers, journalists and the like, etc. China is experiencing the most sustained domestic political repression crackdown since Tiananmen Square. For all of those who hoped that China was going to move in a more liberal and more open direction, that’s depressing. But that’s actually not the main thrust of my talk today. Rather, when I say that China is actually entering a darker era, I mean that what we’re seeing is the steady erosion of the authoritarian rules of the game that have held sway since the beginning of the reform era. For all the problems associated with the existing regime, as some of those other things start to give way, you’re going to see something potentially much, much worse emerge. Now, not everyone agrees, so let me start off with the argument on the other side. This isn’t to say that this is an argument that Neysun is advancing, but there are other folks out there who are making this argument. Their argument runs something like this: since Xi Jinping’s rise to power in 2012, there has been a strand of opinion both in China but also abroad arguing the following: sure, Xi Jinping is tough, he’s harsh, he’s riding roughshod over state and society alike, what with the anti-corruption campaign and the domestic political crackdown. But tough times call for a strong leader, and Xi is addressing the dangerous weakness that characterized the Hu Jintao administration. He’s centralizing power, and at the end of the day he’s building new institutions to govern China. Sure, these are going to be highly illiberal, they’re going to be strengthening authoritarianism. But regardless of what you normatively think of these trends, they reflect the renewal of China’s authoritarian state. These arguments aren’t just coming out of Chinese state media; you find them in some foreign scholars as well, from figures such as Professor Paul Gewirtz with respect to the legal system, and from Professor Fu Hualing at HKU with respect to Party anti-corruption organs. Nor are these arguments without support. If you were going to try to make the best argument on their behalf, this is what you would do. Establish circuit tribunals of the Supreme People’s Court in regional centers like Shenzhen and Shenyang. Create cross-jurisdictional tribunals that cut across existing administrative boundaries. Decouple control over local court funding and personnel decisions and vest it with provincial courts. Strengthen the power of the central disciplinary committee by establishing offices in all central-level Party organs and SOEs. Increase the control of the central disciplinary committee over provincial disciplinary chiefs. Increase the numbers and power of disciplinary personnel at the central level. You could point to all of those things and you could say they reflect a clear effort to centralize power. And you would be absolutely correct in this. And you could try to go one step further and say that what these represent is an evolution of a new, more institutionalized, centralized form of authoritarian rule. But no, that is one step too far. What’s taking place now is fundamentally different, and there are three reasons for this. The first is that some of those reforms that I just talked about aren’t really about building up institutions. Instead, they’re about seizing control of particular bureaucratic apparatuses for the greater exercise of personal power. You can’t confuse greater centralization and concentration of power in the hands of an individual with greater institutionalization of authoritarian rule. The domestic security apparatus is one example. In the late Hu Jintao era around 2010, the domestic party political-legal apparatus emerged as this vast terrain, this sprawling apparatus, a fiefdom that was under control of the former security czar. Since Zhou Yongkang was taken down, that power has been taken over by Xi Jinping personally. The creation of the new National Security Commission has absorbed that prior turf. This means that Xi Jinping is at the top of that particular commission via his intermediary, Meng Jianzhu. But that’s Xi’s turf, and it’s not responsible to existing Party institutions such as the Politburo Standing Committee. Rather, it answers to Xi himself. Or, you could look more carefully at what has taken place in the Party disciplinary apparatus. Scholars who had looked at the evolution of these organs up until 2012 had found a steady trend towards centralizing control over the disciplinary commissions in the hands of Party standing committees, and had observed (since 1992) a greater professionalization of their mandate, with the Disciplinary Inspection Committees increasingly focused on anti-graft work rather than rectification of political errors. Sounds like healthy institutionalization, right? Well, now consider what you have seen since 2012: centralization of control in the hands of Wang Qishan and Xi Jinping, and an expanded effort to use the disciplinary apparatus to go after not just corruption, but sloth, failure to act, being disloyal to the top leadership (i.e. Xi), or voicing improper comments or political opinions. That’s a reversion to an earlier pattern. A pattern in which the discipline committees are being used as a political tool to shake the entire Party apparatus. And this is being accomplished not by the organic growth of institutional channels of monitoring and control, but by central inspection groups that periodically sweep into given government and Party organs and put the fear of God (or Xi) into people. That’s a devolution away from institutionalized governance, not progress towards it. The second point that I would make is that at the same time as we are seeing the seizure of key bureaucratic high ground, we are also witnessing the breakdown of the partially institutionalized elite political norms that had developed during the reform era. The takedown of Zhou Yongkang, for example, is simply the most obvious. That’s a flagrant violation of prior reforms that exempted former Politburo Standing Committee members from prosecution. The machinations currently surrounding the power base of Hu Jintao, and the China Youth League, his former base, and that of Jiang Zemin, China’s former top leader of the ’90s and early 2000s, suggest that these efforts may further expand. Similarly, the discussion that maybe term and age limits that developed under the reform era might be loosened to permit Wang Qishan or Xi Jinping to stay on after they would be expected to retire suggest that maybe this progression of breaking particular partial institutionalized norms could continue even further. The cultivation of a budding cult of personality around the central leader. The pivot away from the Communist Party’s own prior revolutionary or socialist roots in favor of a more ethnocentric, ethno-nationalist ideology rooted in history, religion, and Confucianism. Those three things taken together, fear, ideology, personal charisma, these aren’t about institutionalized rule. For those of you who read Max Weber, that’s actually the antithesis of what an institutionalized bureaucratic rule looks like. I think the entire reform era of the Chinese party-state's effort to build more institutionalized systems of rule is being reversed. What is happening is that this failure to push political reform in an earlier period is now leading the entire system to cannibalize itself and its prior political institutionalization. Note that this isn’t the same thing as saying that Xi is the new Mao. If you were an optimist, you would note that there are still important differences. For all of the centralization of power that’s going on, you still don’t see him calling the people out onto the streets to engage in Maoist style mass movements. Until you go to that step, you really can’t say that this is full-blown Maoist. Now, if you’re a pessimist, you might say that we haven’t seen that yet. You would note that you can’t get to mass movements until you’ve cultivated a cult of personality, established heavy control over the media, centralized power to a sufficient degree, etc. Moreover, it’s more likely that you might start to get things like that happening when you see the economy really hit a wall, for example, or when Xi starts to run into significant difficulties imposing his will on a recalcitrant bureaucracy. In such a situation, resorting to that last step of then going back to the streets in a Maoist style mass movement might not only be conceivable, but it actually might also be entirely rational behavior from Xi Jinping’s own perspective. In closing, let me just say to people who say “well, that can’t possibly ever happen, politics in China has become too institutionalized in recent decades, you could never see the rise of a populist demagogue along the lines of the past,” I would just simply ask, “have you seen what’s happened to the Republican Party over the last year?” Stuff like this does happen. Anyway, I’ll stop there and I look forward to the discussion. Matt Schiavenza: Thank you very much, Neysun and Carl. As a non-legal-expert, one thing that strikes me is that we have the anti-corruption campaign. If you think about it, in a way, the anti-corruption campaign is in theory designed to move against personal power, designed to hold officials accountable towards a system of ethics, towards a system of laws, towards a system of something. And yet, the cynical take on China is that the anti-corruption campaign that Xi Jinping has launched with great fanfare is simply a way for him to consolidate political power, to sideline his adversaries within the Party. Neysun, I was intrigued by your description of how the professionalization of the legal system has continued in spite of Xi’s power play. I wanted to ask how you see that. Will the anti-corruption campaign have any payoff towards creating stronger institutions, or is it simply a nice way for Xi to get rid of his enemies? Neysun Mahboubi: I’m going to take that bait to some extent. But I’m going to start by talking about something else, if that’s ok. As I was listening to Carl’s presentation, which I agree with to a great extent, it struck me that there was one particular issue that might be a good place to highlight our slightly different perspectives. That is centralization of court funding. So, Carl rightly said that one of the things that was going to come out of the Fourth Plenum Decision—and that is emphasized in these judicial reform pilots in a number of cities including Shanghai—is trying to move the funding of local courts up from the localities where they’re situated. Now, this has been an issue for as long as we’ve been looking at Chinese law under the C.C.P. The fact that local courts and judges are dependent on local governments for their funding, and also for their appointments, has seemed to be a major reason why local courts have tended to be subservient to the wishes of local governments. And so, for a long time, judicial reformers had been talking about how it would help the independence of courts to have the funding (and appointments) of local judges at least go up to the provincial level, but ideally go up to the central level. This is something that was touched upon in the Supreme People’s Court’s reform program during the administration of former SPC President Xiao Yang. Under the current administration, this has been a focus of discussion about judicial reform, not just in the pilot areas but also more generally. So now we’re seeing, at least in some areas, not necessarily centralization, but at least efforts to situate funding and appointments at the provincial level. For example, in Shanghai, they’re working to have the funding and appointments for local courts come from the Shanghai municipal government. Of course, this policy shift comes with its own issues. One of the most interesting aspects is that local judges often don’t necessarily want to be more independent, because independence also comes with responsibility, which may not be good for them under the current setup where they’re subject to discipline for so-called “wrongful decisions,” as Carl has also written about. And, putting aside the question of whether local judges want more decisional autonomy, there’s also an element where local judges are worried that their overall compensation packages are going to be lower, when coming from the provincial or central government, than if they come from the local government. But putting those issues aside, overall this policy shift seems consistent with long term efforts to secure the independence of local courts and judges. When I look at it, I think, “Well, this is something that reformers have been trying to push for a long time, and there seems to be some movement here and that’s good. This would support greater strengthening of the judicial apparatus, creating more autonomy for legal institutions generally.” And if I understand Carl correctly, he may be more inclined to put this under the rubric of, “This overall centralization is mostly oriented towards personalization of rule.” I don’t want to speak for him, but my impression is that Carl wouldn’t necessarily think that this is quite as positive of a story, in terms of institutionalization or developing the judiciary, as I see it. To him, it’s linked more to the overall dynamics of increased personalized rule. And I can’t disagree with that as a general matter, but it’s hard for me not to see movement on this one particular issue as at least somewhat positive, after all these years of seeing well-meaning legal reformers advocate for it. As for the anti-corruption campaign, I do think anti-corruption clearly has become politicized. Maybe it was always politicized, but I think in the initial phases of it some of us were hoping that the efforts of the discipline inspection commissions would, over time, become more professionalized, and the targets would be chosen in a less political way. If we really got into the weeds of it, I’m sure there’s still some ground for hoping for some possibility of that, but on the whole it does seem fairly clear that this anti-corruption drive has become deeply political. Perhaps it always was, but that is even clearer now. Who gets targeted and why is often hard to disentangle from political reasons. If we really got into it, we might see different levels. Are the people who are getting caught up in this at the higher levels chosen for political reasons? Probably. But at the lower levels, is there some element where people are being targeted because, in some sort of objective sense, they’re more corrupt than someone else? Maybe. I think one of the dilemmas of this is that, speaking a bit broadly, but I think rightly, it’s very hard to be an official in China and not be at least a little corrupt. It’s embedded in the nature of being an official there. And others have written and talked about this. It’s just part of how you navigate that system. You can’t really do it unless there’s some element of corruption. So, in that sense, all officials can be subject to anti-corruption campaigns or crackdowns. Why one or another gets targeted, I mean, is there some corruption that is “worse” than others? Perhaps, objectively, some corruption involves a higher amount, and so that official is the one who is punished? Or does it have more to do with who is on the wrong side politically? It’s hard to escape the conclusion that it’s more the latter. Carl Minzner: I’ll pick up on that. Actually, I don’t totally disagree with Neysun with respect to court funding. I think the overall trajectory of Beijing’s efforts is to figure out tools by which it can re-centralize control over the system. Chinese authorities are interested in figuring out how to make courts more independent from local interest groups, even if there is no interest in making them independent from Party control. The other point I would make is that China is not a monolith; there are many people in the system speaking with different voices. Certainly what’s happened since 2012 within the Supreme People’s Court, is that the legal technocrats have been put back in control, and so you’re seeing a different set of policies that are being pursued within the court system itself. Five years ago, I was quite negative on what was happening within the court system. Trends during the late Hu Jintao era were very negative. As you mentioned, Party hack Wang Shengjun was head of the Supreme People’s Court. That reflected the influence of Zhou Yongkang’s apparatus within the Party political apparatus. But at that point, trends in Chinese politics more generally were more unclear. Back in 2011, the negative trends I was seeing were curtailed within the political-legal apparatus. Now in 2016, what I see is that things within the court system itself may be going in an interesting direction, but the much broader atmosphere is positively toxic. How long can court reform last if the broader atmosphere is going toxic? Matt Schiavenza: One of the things I found interesting in a recent paper of yours, is that you talk about certain authoritarian states like Singapore. One of the reasons is that you say Singapore has a relatively successful version of authoritarianism is because its officials are well compensated; they have a strong incentive to cooperate. My question is, looking at this new phase we are in, in Chinese communism, if you’re an official, have the rules of the game changed? Do you know what to do? How is this uncertainty going to play out? Are people going to be as invested in the system if the system seems to be less certain? I’m curious what the implications are not only for the Zhou Yongkangs at the top but also for the more rank and file Party officials throughout the country. Are they scared? Carl Minzner: Yeah, I think that’s exactly what’s happening. The rules of the game in the ’80s or ’90s were just do what we want and you can get rich too. There was money flowing in the system, there were rewards flowing in the system. Now that’s shifted. What’s really happening now, the crackdown on excess, is not necessarily a bad thing. But the uncertainty coming from the crackdown, and the removal of the economic levers, is starting to change the calculus for mid-level bureaucrats. It’s leading to a range of different behaviors. On the one hand, you’re seeing some people hide behind their desks—not do anything too dramatic and try not to get into trouble. If I stick my head out and actively fulfill x mandate or y mandate, maybe I’ll get my supervisor upset, maybe I’ll get my rival upset. People start to freeze up. The other thing it leads people to do is to try to get money and children out of the country. Look at real estate in New York or Vancouver, and you can see a large amount of money leaving the system. That’s partially because people are getting one foot out of the door. Neysun Mahboubi: I completely agree that one of the reactions of local officials, to the anti-corruption campaign, has been to become much more cautious. A lot of the dynamic driving economic development up to this point had been local officials trying to do things to get attention, to distinguish themselves—sometimes with projects that weren’t necessarily good ideas, like building ghost malls. And a lot of that has really been shut down now, and to a degree where Li Keqiang has been giving speeches suggesting that local officials aren’t doing their jobs, are being too cautious. Also, one thing which is clear to me and I think to all observers is that there was a high-level determination by Xi Jinping and his power base that the Party had lost control—over the economy, society, politics—and they wanted to re-assert the Party. That’s clearly something that’s been going on over the past few years: remobilization of Party apparatuses throughout the system, even in places like the educational institutions, universities in particular, which have always seemed to be one of the bastions of real hope in China. Now, the subject of this panel is the direction of legal reform in this overall context. But this sort of exchange makes me start to think that possibly an even more significant discussion—which I’m not sure either one of us is in the best position to talk about—is what the direction is for economic reform. Because that seems to be increasingly an issue, and an issue that is possibly even deeper than the legal reform questions. After all, the revitalization of Party control and restricting the space for people to be innovative or entrepreneurial, whether it’s officials or others in society, that’s not necessarily good for economic development. At a very high level of abstraction, sometimes people suggest that Xi Jinping and his advisers determined that reassertion of Party control is the most important thing—and even if economic reform or economic development suffers because of it, that’s okay because they have to reassert Party control, that has to be the driving dynamic. So it will be interesting to see if this economic slowdown starts to impede on the approach that Xi Jinping and his advisors have been taking. Carl Minzner: Right. I think that’s the big question. One of the characteristics of the last 30 years is that everything we’ve seen has been under a regime of double-digit growth. What happens when things slow down? The optimists think that China is currently slowing down to under 6.5 percent growth going forward long term. The pessimists would say you could have a really sharp dive within a year or two. At that point, what happens when you face that situation? Neysun Mahboubi: Professor Flaherty talked about Andrew Nathan, and it made me think, in the context of this discussion, that Professor Nathan has these two articles that sort of book-end each other. One was on “authoritarian resilience” in 2003, and the second in 2009 was on “authoritarian impermanence.” So which one is it? His authoritarian resilience argument is that this has turned out to be a fairly sophisticated, adept authoritarian party that can figure out how to release steam where it needs to release steam, enhance repression where it needs to enhance repression, keep up economic growth to a certain degree, that altogether helps it to maintain power in a way that people had not been expecting authoritarian parties to be able to do. And I understand that his “authoritarian impermanence” article in 2009 doesn’t completely walk back from that, but it does suggest that this is all brittle, and not capable of withstanding a major exogenous shock. There could be a lot of different possibilities, like major economic catastrophe. We just don’t know if the Chinese Communist Party—with all the different things it has been doing, all the different innovations in repression or maintaining control that it’s been pioneering—can withstand a severe economic shock. I don’t think we know that, and we may find out, frankly. Matt Schiavenza: The question of resilience is an interesting one. One thing that’s struck me over the last few years, is in 2010 to 2011 you had a raft of editorials from people, Eric X. Li and Daniel Bell discussing the Chinese political system as a plausible alternative to liberal democracy that’s systematized, that produces results, that is less susceptible to the torpor and the issues we have in American or European systems of governance. Has Xi’s ascension to power forced us all to rethink our assumptions? Is the Chinese Communist Party and the Chinese system of government winging it, is it kind of making things up as it goes along in a certain way? Is the Xi period of establishing a lot of personal control an aberration? Is this the new normal? Or is he going to be just an unusually powerful leader and will his successor revert back to Hu Jintao status? Carl Minzner: That’s an interesting question. There’s this whole group of observers. I don't know how to describe them, but it’s the people who believe in the myth of the technocratic super state. I run into a lot of Europeans who are disgruntled with all the problems of their democracies, and they ask a lot of questions along the following lines: can you teach us how the Chinese Communist Party rules the country so effectively, because we need to adopt that for Europe. That narrative is something that I’ve seen over the last few years. I think it’s tied to China’s rapid economic growth. I think it’s also tied to a perception that China has stable elite rule capable of planning for the long term, that isn’t governed by four-year election cycles, that can sort of think 20 or 30 years ahead. I think that view is now starting to run into challenges. Once they see that Zhou Yongkang has just gone to prison for life, and mid-level bureaucrats are cowering in fear as a result of the anti-corruption campaign, things are starting to look a little less like the technocratic narrative people want to tell. Currently, some folks are still saying, “Well, you know, perhaps Xi needs to do this, but at the end of the day he’s highly educated and the next generation is highly educated, so everything is going to be okay.” People are just now batting around ideas about what is taking place in China, but I don’t think a clear consensus has been formed yet. Neysun Mahboubi: The only thing I’d add to that is in relation to Daniel Bell and Eric X. Li. I do think there is an audience for their views. It’s pretty obvious that Western multi-party democracies have a lot of issues. We live in one that, clearly, is exhibiting a lot of issues right now. And so, it’s one thing to promote democratization generally, or even multi-party democratization, but there’s a really well-founded reluctance to say that the particular forms of institutions and rules that we’ve developed in, for example, the United States are the best you could possibly come up with and have to be copied exactly. So that is one ground for listening to what Bell and Li have to say. The second ground is that the daily reality of Chinese governance simply does not fit the caricature of “this is just repression all the way through.” There is a lot of actual responsiveness, and accountability, and politics. There’s something that I hope many of you have seen, there’s a documentary made about the mayor of Datong that I think won some award at Sundance, and then on the New York Times website they did a 13-minute brief version of it, an “op-doc.” It’s really cool. If you have 13 minutes to spare, it’s a good use of 13 minutes. It definitely illustrates that in this authoritarian and in many ways repressive atmosphere, there is actual politics and citizen pressure, political responsiveness, there’s all this stuff going on, so if you know that, then you’ll also be interested in what Eric X. Li and Daniel Bell have to say. The problem is that they both take it way too far, in my opinion. Carl Minzner: Neither of them is a Chinese citizen. Neysun Mahboubi: Well that too. But they take what could be a more moderate approach, along the lines of “these institutions you have in the West have problems, and there are some aspects of this [Chinese] system that aren’t horrible,” and turn it into something that to me sounds like “this is a much better model” or “this is a model that other places should study.” There are just too many issues in China, I think, that are so palpable, that it makes the latter approach fundamentally problematic. But it is still worthwhile to think of those first two points: there are flaws in our own systems, and the Chinese system is not a caricature, there are things going on there that are not just repression and darkness all the way down. Martin Flaherty (Fordham Law School): There was sort of an initial disconnect between your two presentations and the sort of poor idea of which way legal reform is going or not in China. Your subsequent discussion bridged that a little but I would like you to bridge it more. So here’s the friendly critique and question. For you Neysun—and we’ve had these kinds of discussions over the years—there is an element of forest for the trees in concentrating on the rhetoric for the Third Plenum, etc. in light of everything else that’s going on. But even within the legal world, and this is something that I think both of you would assume knowledge on, but this should not proceed without some discussion of the crackdown on lawyers, the fact that lawyers are being tortured, disappeared, etc. This may be a little bit of a mean analogy, but if you’re focusing on these possible sources of hope for legal reform, at some level it strikes me that this is a good analysis of a performance of the play Our American Cousin, but there’s this thing called the Lincoln assassination that occurred at the same time that you’re not talking about, right? And so granted that there may be, and you qualify it, etc. But I think there needs to be some sort of relationship and acknowledgement between signs for hope, and signs for real concern, to put it mildly, that are happening not just more generally with regards to crackdown on the Internet and personalized rule, but within the legal system itself. And it seems to me one of the core things is the crackdown on not just weiquan (rights protection) lawyers but really any kind of lawyer and also latent civil society groups like Yirenping, which five years ago were lauded as examples of social reform and now they’re just in the wilderness. So that’s my challenge to you, is within the world of law, balancing how you weigh the sources for hope you’re pointing to with all of this other stuff. You allude to the fact that okay, there are 19 references that the Party is above the law, but there are 19 references that the Party is above the law. So for you Carl, I guess my question, or sort of critique, friendly amendment, would be that I think I entirely agree with you about the phenomenon of deinstitutionalized personalization of rule under Xi, with perhaps the possible exception of the law. There I might just resort to the old bromide, and what may unite the both of you, is what Xi is really doing going back to the old idea of rule by law? Right? So one way that I might unite both of your remarks, is that Xi is looking at the law and the legal system as one tool in the overall project of strengthening and revitalizing Party power, and strengthening and revitalizing his rule, but it just so happens in this one area, that some degree of institutionalization is a good thing, and that would account for some of the hopeful signs and contextualize. But it would also account for the way that law seems to be a little different than some of these other areas you’re talking about. Neysun Mahboubi: That’s very helpful. I have two main points in response. One is that I do think our respective takes need to be integrated. If I’m painting a somewhat optimistic picture of legal developments, it could be that Carl would even concede a lot of that, but then say “well, look at all these negative things that are swirling around it, the context of the legal system is more negative.” So, even if Carl wanted to concede that some of this stuff within the legal “silo” is positive, his argument seems to be that it’s surrounded by all this other negative stuff that can overwhelm it. And that could well be the case. But in terms of whether that judgment is well founded that there is some positive stuff going on in the legal system—if it’s indeed looking at the play as opposed to the assassination—I think the dimension of it that is most significant, as I articulated earlier, is that which has to do with the legal professionals who are in the system. There’s a continuity there: these are people who have been doing this before Xi and Li, before Hu and Wen, and who have been fighting these battles in different ways for a long time. And I can make it more concrete by talking about something that I look at very specifically, which is the development of an administrative procedure law in China. If you’ll indulge me a few moments on administrative law and it won’t drive people to the exits, in the U.S. we have this law, the Administrative Procedure Act (APA), that sets default rules for how agencies should make decisions, and also provides for judicial review if decisions are made unlawfully. So there’s been this drive on the part of legal reformers in China to develop a Chinese version of the APA, that in some ways is rooted in the early 1980s and was fitfully advanced through the 1990s and reached a certain point in 2004 where legal reformers got an actual draft submitted to the National People’s Congress. And it died there, because politically this seemed too difficult to do, to have a default law that set fairly rigorous standards for how government agencies in China should make decisions, in a context where, for political purposes, it made sense for agencies to have more discretion. What the legal reformers then proceeded to do, as a way to move the ball forward, was to find local officials interested in pioneering, in their respective localities, administrative regulations that were modeled after the law the reformers wanted at the national level. And the first of these localities to issue such an administrative procedure regulation was Hunan province, which was then run by Zhou Qiang, who as I mentioned is now the president of the Supreme People’s Court—it illustrates that he’s embedded with this legal reform community. So legal reformers were able to get Hunan province, and a few other localities as well, to pass these local administrative regulations that are basically what they were trying to secure at the national level. Their approach here is that, if they can get enough local areas to do this, it could put pressure on the national level to have a national administrative procedure law. Now, this whole impetus, this whole desire, is not Xi Jinping’s goal or Hu Jintao’s goal, this is legal professionals who care about values that have to do with the law, which are separate from “rule by law” or leadership of the Party, trying to advance fairness and justice in the country. And they’ve been doing this for a long time. In the Fourth Plenum decision, there’s language that supports in a very technical way some of the things that they’re trying to do at the local level and then build up, and so that gives them further space to do it. That’s the part that seems positive to me. That these people exist, and then there may be aspects of the environment that give them more space to push things forward. But, at the end of the day, I am still reminded of the critique that as admirable as these people are, and as inspiring as it is that they keep trying to push forward these types of reforms, it may be that the larger dynamic—“the assassination of president Lincoln”—is still the dominant story, and it would be hard for the efforts of legal reformers on their own to really create a more fair and just legal system. That’s very plausible. And it is truly ironic that, as the Party is talking about the development of the legal system, at the very same time it is also cracking down on lawyers. There is such a palpable disconnect here, it’s hard to get past that. Carl Minzner: I can try to respond and bridge both your question and Neysun’s comments. Back in the ’80s and ’90s, when Chinese authorities themselves raised the mantra of rule by law up to a central point in the Party slogan, they opened space that permitted a range of different people room to maneuver. Once you start to invoke that line, all those people we know who are involved with legal reform, they’ve drunk the Kool-Aid, and they start going on and believe that they can start working on a range of different issues. Some go into the state. And they start working from the top down, building the roof of the rule-of-law house. And then you also have the people who are not going into the state apparatus, people like the activist lawyers, and they’re going in and trying to work from the bottom up, building the walls and this stuff at the bottom. Precisely because the whole rule-of-law space is somewhat undefined, you have got this gray zone, there’s space for both groups to work on things. The Party itself doesn’t have a strong narrative in the late ’90s and early 2000s regarding what is permissible on these points. What happens over the last 10-15 years is that grey space constricts. The Party decides that it is okay with the folks working on issues from the top-down; but then they close down the space for the guys building the walls and working from the bottom-up. They throw a lot more resources, especially in the last few years, at the people working on the roof. Does this count as institution building or not? To answer that, you need to figure out whether you believe that houses with Chinese characteristics only need the roof. Just maybe, if you start removing the walls and support structures, just maybe there’s a real problem associated with the building of your house. It depends what you think about that. Audience Member: I’m curious to know if there’s anything to be learned from understanding the dynamics of China’s pipeline of lawyers and looking at who young lawyers are, who’s attracted to the legal profession, and what do they end up doing after their education? So I guess the question is what impact the changes you’re describing could have on what that pipeline looks like, and also what are the chances that an emerging generation within the legal profession might change direction one way or the other. Neysun Mahboubi: That’s a great question, and there’s so much there it would be hard to give a comprehensive answer. But two thoughts that immediately came to mind: first, even just by the metric of “what are Chinese LL.M. students in US law schools like these days?” you can see a definite difference between the kinds of students you saw 8-9 years ago, who were the products of Chinese law schools then, and the kinds of students you see now. There's palpably less sophistication among current Chinese LL.M students, frankly, about the problems of authoritarian rule in China. There's more reluctance, for example, to attend talks by someone like [activist legal scholar] Teng Biao, because he’s a more politicized figure, and theirs seems to be a more career-focused orientation. The students are here to get a degree, get a job. Those are just my impressions, but I think probably will hold up for a lot of U.S. law schools. This all seems to be evidence that there has been a real shift in the openness of discussion within Chinese law schools. Another example is that the types of people who were the most popular law professors eight or nine years ago in China are not necessarily the popular professors these days. The types of Chinese law professors who are edgy, pushing against the system, etc., their classes used to be filled with students. And that’s no longer as much the case. Now, the law professors who tend to be a little more conservative in their orientation, those are the people who tend to get large student turnout. That’s again just my impression, but another basis for my suggesting that Chinese law schools are less the incubators for really reformist thinking among students that they may have been eight or nine years ago. And it’s possible that, with the revitalization of the Party apparatus within Chinese universities, this trend is only going to accelerate. So what you’re seeing, even in the top law schools in China, is that the graduates are basically people who aren’t challenging the system as much but who are interested in making money, finding jobs in foreign law firms or Chinese law firms, and to me that’s troubling. Is that really so different from what we’re seeing in U.S. law schools? I’m not sure, that’s another discussion I suppose. Audience Member: I was wondering if I could ask you about the impact of environmental litigation on legal reform? We’ve seen many lawsuits and protests concerning the environment and it appears that the government is allowing some information to be shared to a certain extent, as long as some boundaries are set. What do you see as the impact of these kinds of authorized environmental lawsuits on the effect of reform? Do you think this is a cause for optimism, or do you think that this litigation will remain fairly localized instead of being rolled into affecting the system? Neysun Mahboubi: Well, the environmental area has seemed to be an area in which the central government has given some space for actors to bring lawsuits and do advocacy to try to improve things, because the leadership knows that people are upset about the environment and leaders themselves have experienced the environment as a negative thing. So, in a lot of ways, the environmental sphere has seemed to be a more open sphere than some of the others. Within that context, these environmental lawsuits are a good example of what I’ve been trying to highlight—which is, pockets of legal development that seem authentic and driven by factors that are not simply a question of advancing instrumental authoritarian rule, and have some potential for hope. I would add that to the list of the types of things that I was referring to earlier. Now, we could come up with a test: Are environmental lawsuits brought? Yes, they are. Are they successful? To a large degree, many are. So what else would we be looking for? Your comment suggests that we see these more at the local level, so you’re suggesting there should be lawsuits that are brought against provincial or national authorities, or cross-regional? If we are in fact seeing more environmental lawsuits at the local level, and if environmental lawsuits are successful—in the sense that they are actually working to shut down polluting factories, or get compensation for people who have experienced pollution—that all seems like a positive development in and of itself. Maybe we want more, maybe we want the responsibility for environmental degradation to be handled by even higher levels. But just that on its own, to the extent that it’s true, seems like a positive development. It fits the narrative I was trying to tell about pockets of legal development that are withstanding the overall negative turns in Chinese politics. Audience Member: That had factories showing what emissions there were, and which ones were over the legal limit. You could easily access that. Carl Minzner: And that would then create popular pressure. In some ways, you could tell a story about how it’s interlinked, because citizens are using open government information and pushing for transparency within the system. But I don’t think he had flagged the court system, the legal litigation, as the key channel by which it is happening. I think the interesting comparison is to the Minimata Bay litigation from the 1970s in Japan. Compare that with China today—because my understanding is that the environmental litigation in that case in Japan in the 1970s triggered a fundamental institutional shift within the Japanese bureaucracy. I think that would be an interesting comparison. My impression was Alex was saying it wasn’t so much the courts that had been the trigger; it had been the more diffuse popular sentiment. Audience Member: Professor Minzner, is there a possibility of a greater checks and balances system in China? I mean similar to the United States? Or a checks and balances system like a division of power not democracy, or not necessarily a voting or election system, maybe some kind of balance or one sector of the government not having a trump card if you will, to do whatever it wants? Carl Minzner: That’s an interesting question. That’s something that Chinese authorities themselves are kind of grappling with. They’ve definitely ruled out multi-party democracy. And even allowing constitutional checks on Party power seems to be off the table. So the interesting question is: Is there something else that you could come up with that would work in the same way? That would resolve the problems they’re trying to address without raising deeper political questions. I think that’s an interesting thing to think about China’s own history, to think about its institutions. Can you come up with something else? With respect to Marty and Neysun, the interesting question is do you need lawyers for rule of law? Can you come up with a system where the legally trained and honest people within the system work within the apparatus and they can get stuff done, but they don’t actually need lawyers and the bar? Let’s just throw this out there: Do you think it’s necessary to have lawyers? Neysun Mahboubi: I’ll get to the lawyers too, but just initially as a response to the question, I think something I’ll run through, especially for those who aren’t as familiar with China, it’s important to emphasize there is institutional differentiation among institutions of the Chinese government. So there’s the National People’s Congress, there’s the State Council, there’s the court system, there’s the procuratorate, there’s the discipline inspection apparatus, and all of these institutions have their own turfs, and there are actual bureaucratic battles. I think sometimes we can get this impression of China as this monolithic, unitary place, but there’s actually quite a lot of . . . I would even say “checks and balances” going on between those institutions. The problem is that what unites them all is the Party. As long as that’s the case, as long as the Party infuses all of that, obviously there will be limits to full checks and balances. But there are still going to be fights. There are people in the National People’s Congress who are pissed off at what the State Council is trying to do, or people in the State Council who are pissed off at the Supreme People’s Court’s issuing judicial interpretations. These are genuine fights. But, real checks and balances are hard with the Party being so deeply enmeshed in all of these institutions. In the 1980s, there were some efforts—reaching up to the very highest level, with then General Secretary of the C.C.P. Zhao Ziyang—towards separating the Party and the government. Around 1987-1988, the Plenum of the Party Congress at the time actually openly discussed that topic, and we’re clearly not in that age anymore. One of the lessons drawn from the Tiananmen Square incident was that’s a bad idea, and the Party has gone fully in the other direction. Carl Minzner: And the Soviet Union, too. Neysun Mahboubi: Right, and the Soviet Union crackup influenced that as well. So then you say, “well, are there going to be checks and balances within the Party?” There was a time when people like Cheng Li at Brookings were talking about multi-party factions within the Party, different groups within the Party, elections within the Party, etc. I’m not really sure that that stuff is gone. I mean, there seems to be one faction now that’s winning. So that’s where that’s going. Neysun Mahboubi: Exactly. They don’t want that. They want lawyers to be like, “okay, here are my documents, now I get to see my client, etc.” There’s this effort to take lawyers and put them in this very clean box, and say “that’s what we want.” But maybe that’s not enough, and maybe we need the lawyers who fight more.